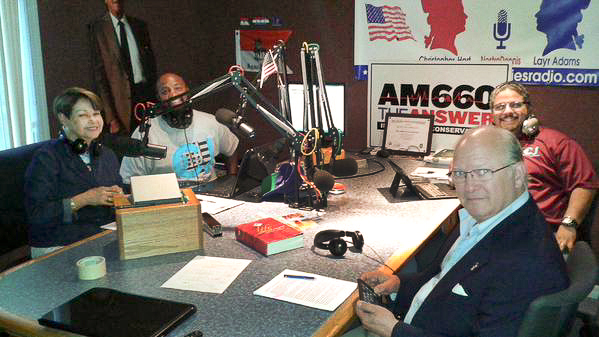 LIFA Founder Pola Hansberger, AM660 Radio Host Carl Jackson, LIFA Executive Director Chris Casler, and Mickey Alvarez. Pola Hansberger, Founder of Legal Immigrants for America (LIFA), and Executive Director Chris Casler discussed discrimination against legal immigrants and American citizens by government policies that facilitate and encourage illegal immigration. Pola and Chris interacted energetically with Carl Jackson and Mickey Alvarez. The conversation concentrated on questions of immigration – legal and illegal – from a Christian worldview. Christian, Christianity, illegal immigrants, Legal Immigrants For America, LIFA, Muslim, Refugee Resettlement Watch, resettlement. Bookmark.